The human hand is a fascinatingly intricate arrangement of pulleys, tendons, muscles, and nerves that work together in a complex system to perform daily tasks. It is often difficult to visualize the various paths that the tendons and muscles take. It can also make a thorough hand exam difficult to perform with proficiency. This post will review the clinically relevant anatomy of the hand, and apply it to both a screening exam and detailed exam with maneuvers used in the diagnosis of common hand injuries. This screening exam can be used in the case of a fracture/dislocation at or proximal to the wrist, or in a general trauma to ensure that there has not been a nerve injury – from the cervical spine, through the brachial plexus, and into the extremity. To examine the vascular supply of the hand the examiner should palpate the radial pulse and check digital capillary refill. Using a finger pulse oximeter is a useful adjunct for evaluating perfusion; anything below 95 in a traumatized limb/digit raises concern. The radial, median, and ulnar nerves each have sensory and motor functions that should be evaluated. Motor: Extend the wrist. If too painful due to injury, then extension of the thumb IP joint may be substituted. Now for a more detailed exam, which should be used when a patient comes in with a specific hand complaint or if there is concern for muscle or tendon injury. Lacerations/abrasions: Any skin break over a joint (eg : fight bite) may look innocent, but actually provides a route for inoculation of the joint with infection and can be serious. Inflammation: Can be acute from recent injury/infection or chronic from inflammatory states such as RA. Atrophy: Think critically about the location of the atrophy, is it diffuse or does it fit one nerve distribution? For example, carpal tunnel syndrome may produce atrophy in the thenar muscles supplied by the median nerve. Ulnar nerve entrapment at the elbow (Cubital tunnel syndrome) could cause hypothenar muscle wasting and intrinsic wasting (most visible at first dorsal interosseous, along dorsal radial border of the index metacarpal). It can be difficult to visualize all of the bones in the hand and wrist in order to palpate them correctly. However, there are a few that emergency medical providers should know in order to catch the most common and consequential injuries. Previous studies have demonstrated that tenderness at the scaphoid tubercle is actually more sensitive than the anatomic snuffbox (95% v. 85%) in diagnosing scaphoid fracture. 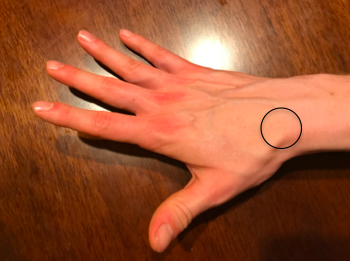 When palpating the anatomic snuffbox you can maximize the surface area that you are palpating by having the patient move their hand into ulnar deviation and thumb abduction. Test range of motion both passively and actively in each joint. Passive ROM gives you information about the joint. You may feel clicking, catching or crepitance. Active ROM provides information about nerve function, muscle strength, joint congruity/stability, and tendon integrity. A full muscle/tendon exam doesn’t need to be a part of every exam in the Emergency Department, we don’t have the time. However, if there is an injury that makes you concerned about the integrity of deep structures in the hand, wrist, or forearm, knowing the course and function of each muscle and tendon is useful. Theoretical cases have been included to provide context. A patient sustained a deep laceration to his right volar forearm from a glass bottle during an altercation at a bar. The sensory exam in the hand is normal, but function is abnormal. In addition to the usual laceration care, you want to ensure all of the underlying tendons from the extrinsic muscles are intact. You need to check the finger and wrist flexors. Most of these are innervated by the median nerve, with the exception being the Flexor Carpi Ulnaris and the Flexor Digitorum Profundus to the small and ring fingers, which are innervated by the ulnar nerve. The same patient presents again after a bar fight, this time sustaining a deep laceration to his dorsal forearm. You want to ensure all of the underlying tendons from the extrinsic muscles are intact. You need to check the extensors. These muscles are all innervated by the radial nerve and are separated into six compartments. The same unfortunate patient returns after yet another bar fight. His other two lacerations are well healed, but now he has sustained a deep laceration to his right palm. 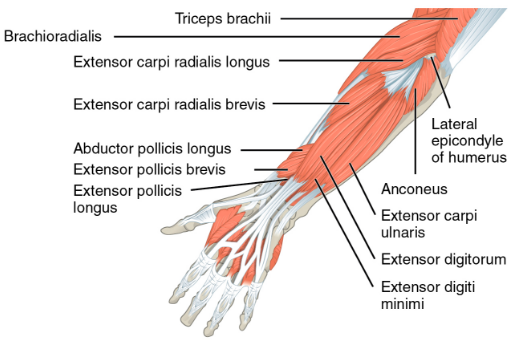 This time you need to check the intrinsic muscles and tendons of the hand. These are innervated by the median and ulnar nerves and are also separated into compartments. Interosseus: Adduct and abduct the fingers. Place the hand flat on table to eliminate interference by extrinsic extensors, hyperextend middle MCP, and move finger from side to side. There are several tests that can be used to examine for common and important injuries. You are working at a ski clinic in Lake Tahoe as part of an elective rotation. A patient presents after a fall backwards onto his R hand while holding his ski pole. He has pain in his thumb, especially on the ulnar aspect of the MCP joint. Evaluation: Test UCL integrity. Hold thumb metacarpal with one hand, and fully extend thumb MCP and apply gentle radial deviation force to see if there is laxity or pain. Test again at 30 degrees of MCP flexion. Test other thumb as a reference (people vary widely in baseline joint laxity). A patient reports that he was playing pickup basketball, got a finger snagged on the opposing player’s shirt, and felt pain when the player pulled away suddenly. Now he has difficulty flexing the fingertip. Most likely diagnosis: Jersey finger, a rupture of the FDP tendon from the distal phalanx. Special test: Hold the patient's MCP and PIP in full extension and ask patient to flex at the DIP. If the FDP is intact the patient will be able to flex at the DIP. The PIP must be held in full extension to isolate FDP function. The same patient presents 6 months later, again playing pickup basketball, but this time he got his finger jammed on the ball going up for a rebound. Now he cannot fully extend it at the tip. Most likely diagnosis: Mallet finger, an avulsion of the extensor digitorum from the distal phalanx. 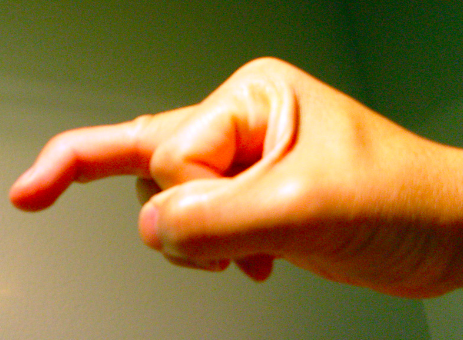 Special test: Hold the middle phalanx of affected finger to isolate DIP and ask patient to actively straighten DIP. If the patient cannot, then the test is positive for Extensor Digitorum injury. You can also passively extend the tip and see if patient is able to hold it there or if it returns to the flexed position. A patient presents with a deep laceration to the dorsum of his 3rd finger, over the middle phalanx. He appears to be able to extend and flex the finger easily, however as an astute ED physician, you are concerned about occult tendon injury. Most likely diagnosis: Central slip injury, a rupture of the central band of the extensor mechanism causes the lateral bands to slide ventrally, preventing extension of the PIP and extension of the DIP. Special Test: Elston’s test. Passively flex the PIP to 90 degrees to relax the lateral bands. Have patient try to extend the finger and provide counter force on middle phalanx. When the patient tries to extend the PIP test the tension at the DIP: If DIP is floppy the central slip is intact, but if the DIP becomes taut then central slip is injured. Evaluating hand trauma requires understanding the anatomy and the functions associated with that anatomy. Having a systematic approach helps, as pain, bleeding, intoxication, and fear can affect the upper extremity exam. It is good practice to start by evaluating for deformity, color change, and wounds. Ask the patient to make a fist and then open it, which can help direct you to the problem area. Test wrist flexion and extension. Evaluate extension of each finger. Evaluate flexion and extension of the thumb IP. Evaluate FDP and FDS of each finger. Test OK sign, fingers crossed (index and middle), spread fingers wide and hold them out against resistance. Test gross sensation in each fingertip, and on the back of the hand. If you do this every time, you are unlikely to miss a substantial injury. From the findings of the general hand exam you can then focally test any trouble areas. Determining adequate perfusion, often via clinical exam (color, temperature, turgor, etc) is critical. 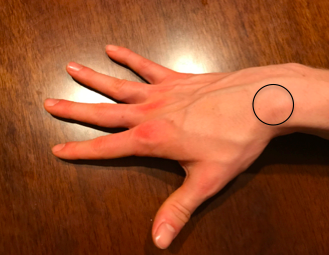 Using a pulse oximeter on an injured finger can help identify threatened digits before the clinical ischemia or venous congestion becomes obvious. Doppler exam of each digital vessel is another useful evaluation tool. Always consider the proximal to distal nature of the anatomy, and tailor the focal exam based on the level of injury. For example, if a patient presents with an injury at the wrist, testing finger flexion will not give any information about the median nerve. The level of injury helps guide what additional components of the exam you need to perform to get the full picture, as laid out in the different discussions between cases 1 and 3 above. The sensory exam is often challenging, especially in traumatized fingers. Pain can be distracting, and edema can cause sensory changes. Gentle sharp sensation (pin-prick) testing is a useful adjunct to the digital sensory exam, especially if only one side is injured and you are trying to clarify whether the digital nerve is intact. Also, if a patient had a tourniquet placed in the field, they may present with an abnormal sensory exam (or even functional exam, depending on duration of ischemia) even if all structures are intact. And, although this may be an obvious reminder, always document a thorough sensory exam before ever administering local anesthesia. • Ghane, MR et al. How trustworthy are clinical examinations and plain radiographs for diagnosis of scaphoid fractures. Trauma Mon Nov 2016. 21(5): e23345. • Giuglae, J et al. The palpable scaphoid surface area in various wrist positions. Journal of Hand Surgery. 1 Oct 2015. 40(1): 2039-2044. • Lin, M. Quick Tip: Elston’s Test for the Finger. Jul 29 2013. ALiEM. • Bookman, A. A., von Schroeder, H. P., & Pham, A. G. (2010). 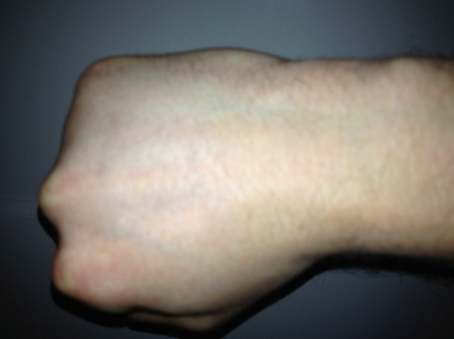 The Wrist and Hand. In Fam’s Muskuloskeletal Exam and Joint Injection Techniques (pp. 29–43). Mosby. • Seiler, JG. (2002). Essentials of Hand Surgery (pp 23-48). Lippincott Williams & Wilkins. Posted on April 16, 2018 by NUEM Blog and filed under Orthopedics and tagged hand exam hand injury hand screening exam skier's thumb gamekeeper's thumb mallet finger jersey finger central slip injury.